Manchester Fern is quilted in a geometric Flower of Life pattern in fern green. Stonewashed for an exceptionally soft feel and sophisticated look. Due to the hand dyed nature and stonewashed finish, slight color variations make each Manchester set unique. 100% cotton, prewashed. This pattern is sold in sets only. The Twin set includes one quilt and one standard sham. The Full Queen set includes one quilt and two standard shams. The King set includes one quilt and two standard shams. Euro shams are offered in a set of 2. Manchester line by C & F Enterprises. Manchester Fern Twin Quilt set includes one quilt and two standard shams. Manchester is quilted in a geometric Flower of Life pattern in Fern green color. Stonewashed for an exceptionally soft feel and sophisticated look. Due to the hand dyed nature and stonewashed finish, slight color variations make each Manchester set unique. Quilt is 66" x 86". One standard sham is included in the set, 20" x 26". Manchester line by C & F Enterprises. Manufacturer's UPC code is 008246325994. Manchester Fern Full Queen Quilt set includes one quilt and two standard shams. Manchester is quilted in a geometric Flower of Life pattern in Fern green color. Stonewashed for an exceptionally soft feel and sophisticated look. Due to the hand dyed nature and stonewashed finish, slight color variations make each Manchester set unique. Quilt is 90" x 92". Fits full and queen size mattresses. Two standard shams are included in the set, each is 20" x 26". Manchester line by C & F Enterprises. Manufacturer's UPC code is 008246326007. 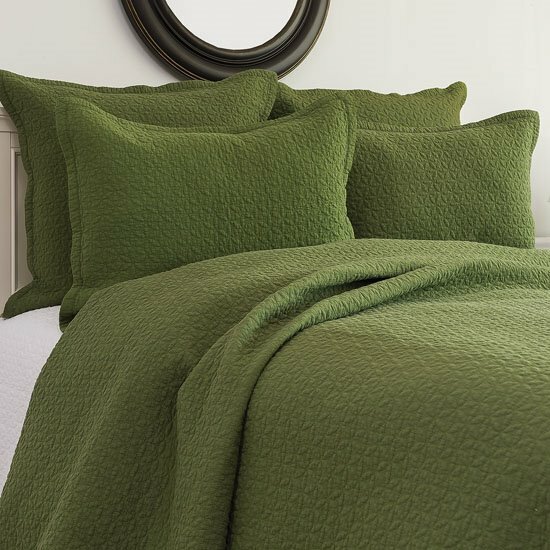 Manchester Fern King Quilt set includes one quilt and two standard shams. Manchester is quilted in a geometric Flower of Life pattern in Fern green color. Stonewashed for an exceptionally soft feel and sophisticated look. Due to the hand dyed nature and stonewashed finish, slight color variations make each Manchester set unique. Quilt is 108" x 92". Two standard shams are included in the set, each is 20" x 26". Manchester line by C & F Enterprises. Manufacturer's UPC code is 008246326014.